This is the piece I submitted to the Center of the World Festival’s (Pine Mountain Club, CA) Art Speaks writing contest held Saturday, August 16th. 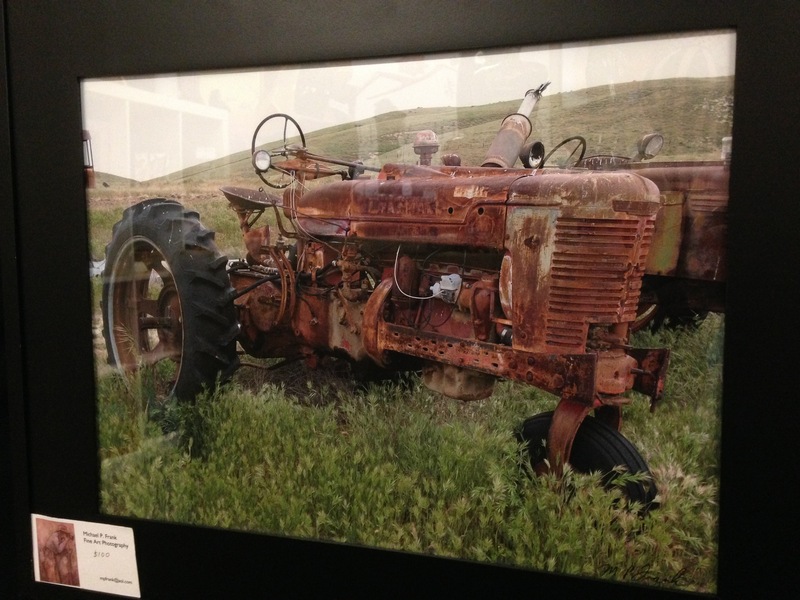 It was “A competition for writers to bring a chosen artwork to life through stories, poems, or other writing genre.” There was a wide variety of local artists’ works to choose from in the gallery, and I selected a photograph of a derelict tractor by photographer Michael P. Frank (see image below). I had to read my piece twice on the day of the festival so the audience members could vote for their favorite. This was the first time I ever participated in this festival—or any kind of competition with my writing for that matter—and it was a fun challenge. Though I didn’t bring home the prize, I hope you enjoy my story! Feels like it’s going to be another scorcher today. Funny how I can tell first thing in the morning even though the sun’s just barely starting to peek over the hills. I guess since all I do now is sit here all day, I’ve become an expert. The weeds have grown up around my axles and even into my engine block, so I doubt I could move at all without some help. My friends the birds come and visit me, sitting in my shade during the day or nesting under my hood at night—though I wish they wouldn’t leave their droppings all over me. The heat didn’t used to bother me much, long ago when I was a shiny new tractor working away in the fields. It felt great to till the deep, dark soil knowing I was doing my part to help bring new life and abundance to the vast emptiness. First, I pulled the tiller to break up the land. Then came the seed drill to plant the seeds. I spent many a back-breaking day all through the growing season: fertilizing with the spreader, controlling weeds and pests with the sprayer. Always something to do—back and forth, up and down the fields, watching the crops sprout then grow along their orderly rows. I loved working under the bright blue sky, even with the sun beating down like crazy. I think I enjoyed autumn even more—pulling the harvester to gather the crops, and wagons to carry the produce to the warehouse where it was packed and shipped off to market. Back then, I’d be parked in the shade of the barn every night. I’d get fresh oil and fuel and have all my mechanical gear checked out several times a week. I was always doing my best, and was always rewarded by being well taken care of. But that seems like ages ago. Now I sit here, rusting away under stormy skies in winter, my paint bleaching and peeling in the broiling hot summers. My beautiful red and gray coloring has faded so badly that I can’t hardly read my name anymore. Newer, fancier equipment was brought in to replace me and I was slowly relegated to more menial tasks until finally I was shoved out here in “the graveyard”. Hadn’t all my work counted for anything at all? I thought that after the hundreds, the thousands, the tens-of-thousands of acres I’d sweated over for all those years I might get a little more respect than this. Am I supposed to sit here until I’m just a pile of rusted steel, overgrown by foxtails and dandelions? Is this the thanks I get? It makes me so mad, my radiator’d be boiling over if it had anything left in it. A while back, somebody calling himself a “collector” was out here with my owner, checking out some of my graveyard compadres. He poked and prodded me a bit, crawling under my belly for a closer look. He talked about a lot of technical things, some of which I actually understood, but then they finally hauled away another of the old-timers. Seems as though these “collectors” actually like old stuff. He mentioned something about fixing up the old guys, giving them an overhaul and a fresh coat of paint so they could be shown off in the town’s Fourth of July parade. Sometimes, they’d be displayed proudly in somebody’s front yard, surrounded by sweet-smelling flower beds. That’d sure be nice—maybe he’ll be back for me someday. I guess there’s not a lot I can do about that. In the end, I suppose it really isn’t too bad; after all, I’ve got a beautiful view and there’s a nice breeze. Good morning to you, Mr. Bird. You’re a bluebird, right? Story © 2014 Douglas P. Kendrick, all rights reserved. This entry was posted in fiction, Writing by dpkworldwide. Bookmark the permalink.